Norbert Brainin was an Austrian (some would say English) violinist born on March 12, 1923 (Heifetz was 22 years old.) He is remembered for having been the first violinist of the Amadeus String Quartet for forty years. He entered the Vienna Conservatory at age 10 and studied with Rosa Rosenfeld and Riccardo Odnoposoff, concertmaster of the Vienna Philharmonic. Five years later (1938), his family was forced to move out of Austria. They soon settled in London where Brainin initially had a hard time - he was put in prison - due to war protocols. Upon his release a few months later, he studied with Carl Flesch and then with Flesch's assistant, Max Rostal. Flesch had fled to Amsterdam to get away from the war's difficulties. Brainin entered and won the gold medal in the Carl Flesch violin competition in London in 1946. The following year, he formed the Brainin String Quartet which changed its name a year later. On April 10, 1948, the Amadeus String Quartet made its debut at Wigmore Hall. In the 40 years of its existence, the quartet never changed personnel and only disbanded because its violist passed away - he was deemed irreplaceable. In the late 1980s, Brainin became involved in an effort (which gained momentum in Italy in 1988) to lower the tuning of the concert "A" to 432 hz. (from 440 hz.) Unfortunately, the effort did not succeed. He also taught in Cologne (1971-2005) and in London (1986-2005) and gave master classes around the world. 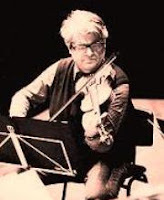 During his career, Brainin played several important violins, including the "Rode" Guarnerius (1734), the "Chaconne" Stradivarius (1725), and the famous "Gibson" Stradivarius (1713), formerly owned by (and twice stolen from) Bronislaw Huberman - now owned by Joshua Bell. Brainin died unexpectedly on April 10, 2005, at age 82.